I know it's only January but I am starting to think about Valentine's Day and what I would like to do with my hubby. I am working of course Valentine's day but I am off the day before. So I have been checking out EdenFantasys to see what I can get to add a little something special to the night. This time around a few things that caught my eye are the massage candles. 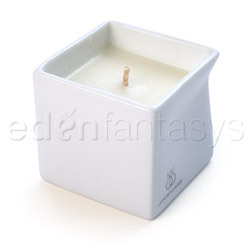 EdenFantasys has a great selection of aroma, massage and edible candles. One massage candle I am looking at is called Afterglow by Jimmyjane. It retails for $27.99. It is also rated Top 10 in popularity! You light this pretty candle which is available in many scents including Dark Vanilla, Cucumber Water, Gingersnap, Grapefruit and a few more. Then when you have some oil melted you then put it in a tray and cool it. Using it for a nice massage with your hunny. Also available are masage rollers and are also available in a kit with this candle.